Tags: 2020VQ, Autumn, Book, Inspiration, Quinn, Randy. I’ve finished writing the book but the complete work is not quite finished! We’ve been teasing at this book release on the front page of our website and in various social media posts for a little bit of time and it’s finally time to dedicate a full blog to the topic. Way back in 2015, inspired by the vast number of request for just such a thing, I set myself the goal to write the book of my life’s journey. As many know, my neurological condition had an interruption planned for 2016 and my writing goal necessarily fell by the wayside. After the two-year delay, I returned in earnest this year to the project and the result has been a fantastic journey in my own growth. I’m here to tell you the draft is complete! We have already passed several edit cycles though a bit more is still being done to polish the final product for release. Writing a book is no small project and this is no small book as it checks in at roughly 100,000 words. The process has involved my generating drafts and working on them myself until I feel they are ready to share with Tracy. She and I then go through an edit cycle together and I cannot stress enough how much this is our book as a result of her incredible talent, support, and encouragement. After we finish each section, it has gone to a professional editor who happens to be a good friend–thank you, Gene Lejeune. I’ve also had a few other friends read some or all to give reactions encouraging still more adjustments. Ultimately we are far enough along to be confident in the information I am sharing now. The title of the book is “See You At The Summit.” The subtitle of “A Journey from the Depths of Loss to the Heights of Achievement” provides a little more insight into this auto-biographical journey. 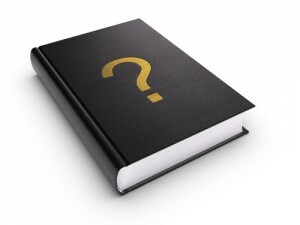 When and how can you expect to have a copy? We plan to have the book available for our 9th Annual Peak Potential Dinner and Auction event on November 17, 2018. Why not join us for the evening which will serve additionally as our initial book launch celebration? This is the unofficial announcement and we expect to make official announcement we hope you’ll help us share far and wide come September. In the meanwhile, here’s the list of chapters in the order presently planned but understanding we are still providing some polish to the final product. I hope you’ll look forward to reading as much as I enjoyed writing it and that soon we will “See you at the summit”! Tags: blind hiker, Hiking, Inspiration, Quinn, Randy. 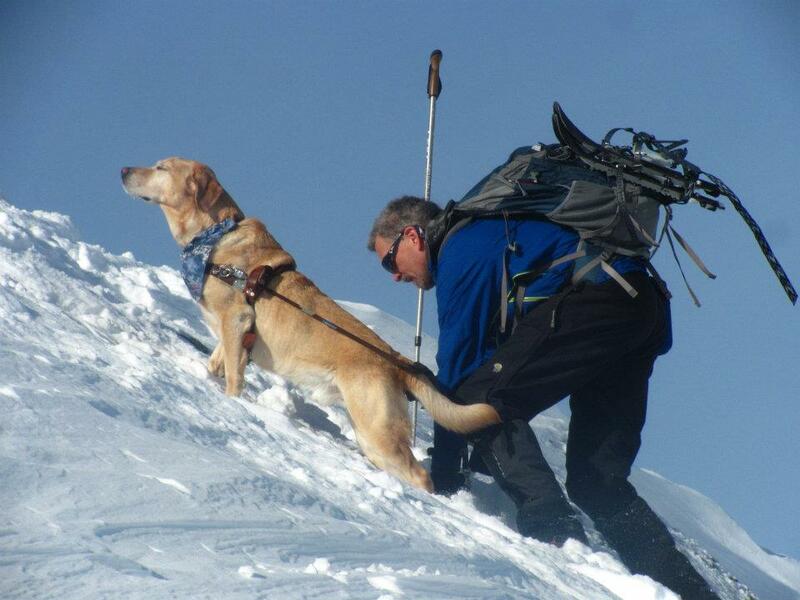 As we pass the anniversary of the loss of Randy’s Guide Dog, the Mighty Quinn, we share a post from January 30, 2016 when Randy shared a chapter from his book-in-progress about taking Quinn’s ashes on his climb up Mount Kilimanjaro. Tags: Inspiration, outdoors, Quinn, Randy. On December 11, 2004, a golden bundle of Labrador retriever came into this world as the ninth puppy in his litter. It was an inauspicious start perhaps for a pup who reached such lofty peaks of success well beyond climbing and guiding. The Mighty Quinn demonstrated love, loyalty, and friendship to me on an unrivaled level which those who witnessed typically found astounding. He had dedication and devotion for certain, and his competitive intensity showed an intelligence and focus beyond all my expectations. In his barely 9 years of life he lived more than most ever dream and he touched the lives of thousands. Much has been, deservedly, shared about Quinn’s life and death. On the anniversary of his birth, I take a special few moments to reflect in joy upon how very fortunate I feel to have had this amazing boy in my life. I think about our mountain adventures and often play a video we call “Winter Celebrations with the Mighty Quinn.” Dina Sylvester created this video at the request of Michelle Brier and I am so thankful for both as it is a fight for me each time I listen to it. For me it captures the joy he felt in his life, or specifically in our winter hiking adventures. I listen for the subtle background sounds of interactions, the clear love and fun in our communications, as well as the playfulness which is interwoven in our work together. Playfulness was a centerpiece of his life for certain. There is no description to this video at this time though I have had it shared with me at times. I know there are countless moments of Quinn joy throughout, so I encourage you to enjoy the short three minutes of heart lifting opportunity to choose, like I will, joy. While I cannot say there will be no hint of sadness in my reflections, I can tell you with certainty that I would gladly choose all of the moments of sadness I’ve ever experienced before, now, and ahead because of the loss of Quinn–I would consider all those moments of pain a bargain price for the incredible joy, love, courage, and freedom Quinn brought into my life during the time we were blessed to share company together. It is why in recollection each day, and especially on his birthday, I choose joy! Tags: 2020VQ, community, Education, Hiking, Inspiration, outdoors, Outreach, Quinn, Randy. School presentations receive a great new enhancement! While presenting at the Bow Elementary School on September 11, I will deliver our very first copy of this fantastic new poster to the NH school systems. We continue to be incredibly proud of the educational outreach provided by 2020 Vision Quest and now believe it’s become just a little better as we leave behind a physical reminder of our positive message. For many, our signature image is this fantastic winter hiking photo taken by Justin Sylvester in January 2012. 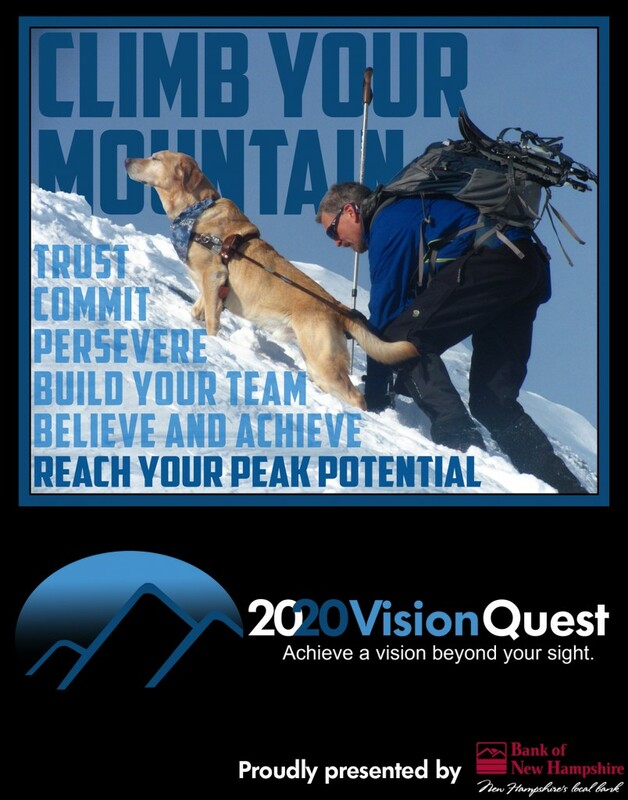 Recently Greg Neault helped coordinate the entire 2020 Vision Quest team in line with his digital creativity to develop this inspirational poster. I believed it would make a tremendously positive impact upon students and staff alike at the many schools we visit and reached out to collaborate with the Bank of New Hampshire. They were enthusiastic to support the positive community benefit and now the finished product has arrived! We are proud of the message shared in the poster and think it will present a potent reminder of many of the messages we share in our educational presentations to schools throughout New Hampshire and beyond. How can you get a poster? The easiest way is to schedule us to visit your classroom or school. We are proud to be called back repeatedly to visit schools who wish to ensure each year’s students have the opportunity to hear our messages. Whether we’ve been to visit you before or this is our first visit, it’s a simple process. Refer us to the teacher, administrator, or even PTA member responsible for coordinating presentations by sending them the link to our “For Educators.” page. From there, we provide the information and contact information to schedule us for a visit. We can and will schedule as far in advance as you require, and in fact, as we become steadily more popular, there is considerable advantage to scheduling early. But we’ll always make every attempt to honor every request for a presentation. More than 60,000 students have experienced the benefit and now through our poster collaboration team we think there’s just one more good reason to schedule with us now! Tags: blind hiker, Hiking, Inspiration, outdoors, Quinn, Randy. Tedy Bruschi hiking with Randy in May 2011. May mountain memories are richly rewarding for me, from my engagement to Tracy on May 1, 2010 atop Mt. 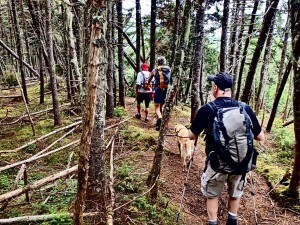 Welch to the May 2, 2011 hike we took with Tedy Bruschi. It is the latter I wish to revisit today although you can certainly tour the recollections from our Blaze of Glory blog. My work with 2020 Vision Quest and Future In Sight combined with my Marathon schedule have limited my opportunities to escape for the altitude adjustments of our wilderness hikes. When spring is slowly releasing winter’s influence and reaching towards summer, the trails are slower still to welcome the warmth and release the snowpack (monorail) which makes hiking particularly challenging for me. Early May on the lower elevations is just right for my reasonable return, so my thoughts are returning and I wanted to share the reflection. So many seasons have turned since then and so much growth in our lives has happened, yet the foundations there remain constant for me today. Tedy Bruschi joined us to learn and practice as well as to celebrate friendship and teamwork. He joined to help, to put emphasis on ability awareness, and to help us with our own outreach in the early days of our charity. While reading and reflecting and listening to both versions of the Quinn vs. Tedy tug-of-war match, I could not help but appreciate how much fun was interwoven in the entire day. There is so much work in our mission, in the training and planning but at the core of it all I hope to always remember and savor the fun in the experiences. May always feels right for rejuvenation to me. I know there is an epic hiking adventure in Peru coming for us in September and the arrival of May heralds a celebration of the joys of hiking and life which await. 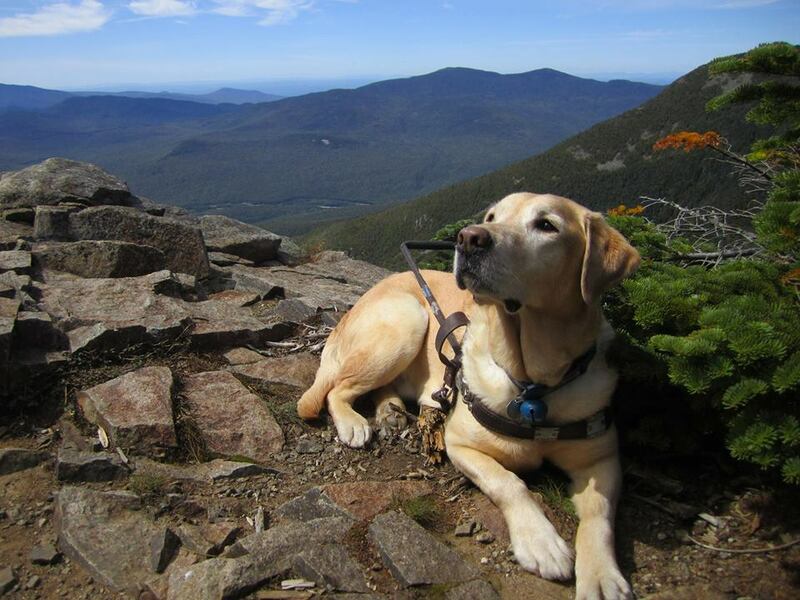 I hope to hear the echoes of Tedy’s laughter on the trails as Autumn guides me where Quinn’s paws proudly pioneered the path before her. I hope for all of you much joy in sharing our adventures ahead and in sharing your own with us as we journey together on the path. 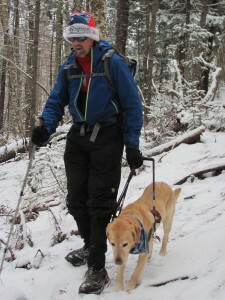 Tags: blind hiker, challenges, community, Hiking, Inspiration, outdoors, Quinn, Randy, winter. Randy and Quinn on Mt. Monroe. 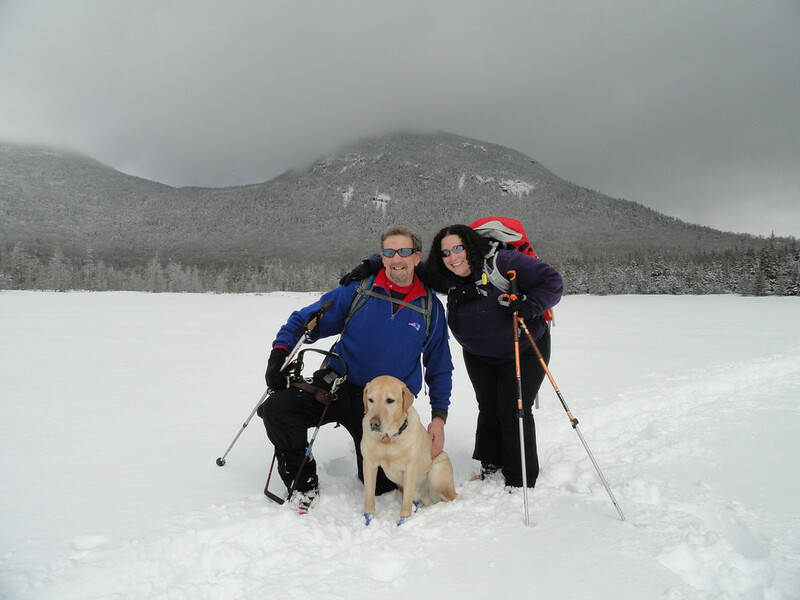 The White Mountains of NH are aptly named in winter, but for me they are the gold which has inspired me beyond my expectations when I founded 2020 Vision Quest with the help of some incredible friends. Throughout this winter of 2016-2017, I especially chose to relive some of the many marvels which comprised the epic single season winter summit of the 48 peaks rising over 4,000 feet. It was only five years ago this was accomplished and yet it seems a lifetime as it was one of many dramatic turning points in my life and worthy of this deeper examination. When Quinn guided me onto the trail at Mt. Tecumseh on December 22, 2011, I had already learned many skills and techniques for hiking totally blind on our rather rugged trails. I had only a taste of what winter brings to the trails and mountains but I had a supportive collection of friends and a determination to give my best to learning, planning, and persevering through all reasonable challenges. When I stepped off the trail after our March 10, 2012 summit of Cannon Mountain, I was bursting with pride for the team of friends, for the magnificent and Mighty Quinn and for the the treasures found along the trails and at the summits of these majestic mountains. I was a different person and while still completely without any sight, I had expanded my vision to see even more possibility ahead for myself, this Charity and the friends with whom I had connected so well. Sharing stories around camps and campfires I doubt I would ever run short of worthy moments just from this winter and certainly I’ve shared some along the journey of this year. It is the expanded horizon of possibility which is the gold from which I draw strength then, now and doubtless onward into my future challenges. Whether pushing over the finish line of a National Marathon Championship, stepping through the Uguru gate at the rooftop of Africa’s Mt. Kilimanjaro, or even the Tough Mudder Leap of Faith out to the trapeze and on to ring the bell, these mountains helped clear my vision and connect me to a foundation of trust in my team and myself. Randy and Quinn on Mt. Garfield. Before this winter I was, I like to think, a man who found comfort in the transition from a sighted world to one of total blindness. I found ways to appreciate my world, challenge myself and live meaningfully. I did not fully appreciate how much kind attention the accomplishment would receive and some of that is no doubt due to the incredible film created by Dina Sylvester, Four More Feet. Despite celebrating each five-year hiking anniversary this winter culminating in the quest completion, I do not and hope never to rest on the nugget of gold in that accomplishment. I certainly do recall the challenges, the problem solving, the laughter, struggles and, oh yes, some moments of pain, but mostly the jubilant feeling of accomplishment. Those remind me some methodology but moreso inspire the passion to experience them all again, not in memory but in new accomplishments. Mountains are synonymous with challenge and it is the lack of challenge which leads to the stagnation I hope to always avoid. The White Mountains of NH are my “forever mountains” and will motivate me to many more things. The Single Winter success of March 10 2012 finalized those feelings within me but it was the miles and miles of the journey in which my transformation forged the passion which will power me in the days ahead. Taking shelter at the snowy summit of Mt. Garfield. Tags: blind hiker, challenges, Hiking, Inspiration, outdoors, Quinn, Randy, success, winter. The plan suggested it was to be a demonstration of Ability Awareness. It was to be an appreciation of the diverse gifts provided by winter hiking. 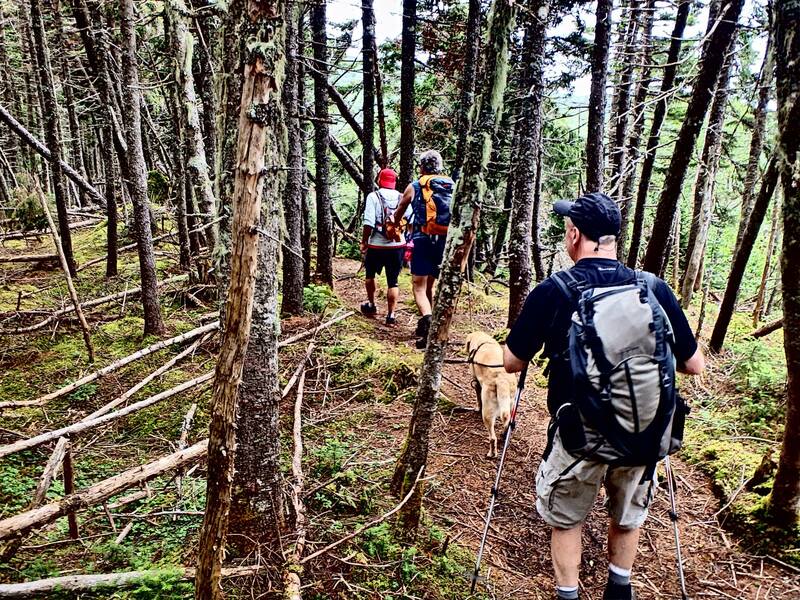 It was a chance to savor the easier footing I would experience as snow filled in those twisty, rocky, root-filled routes we call trails in the White Mountains of NH. The experience would prove to be far greater in scope than I ever realized and like so many things in life, the vastly heightened challenge enhanced the rewards received in like proportion. The greatest gifts were the many friendships found along the trails from Greg Neault at the base of Hale to Justin Sylvester who took the photo to the right and Dina Sutin who filmed the teaser below as well as the accompanying film. Many friends were found and forged along those trails along with the lessons of perseverance, planning, and preparation. As winter arrives five years later, I’m so vastly different than I was when that first December 22 climb of Tecumseh began. I thought it worth a moment to look back and share a little with all of you who were with me and some who have joined us since those days. I have so many thankful moments, so many delightful moments, and so many inspiring moments, I could fill a book well beyond the scope of this blog. As my holiday gift to the blog readers out here, I will share a tale in the blog comments for every person who comments and requests one. Similarly for our social media friends if you share our post and tag me so I can be aware of the share, I’ll give you a tale on your post as well. Happy Holidays and my thanks for the greatest gift of all that winter: Quinn’s incredible work, love, and dedication. Tags: blind hiker, community, Hiking, Inspiration, outdoors, Quinn, Randy. and routes more commonly hiked in the White Mountains and our team was a little short of the ideal numbers for the added risk my blindness brings to remote hiking. I had interacted with Mike Cherim a few times on the internet and was glad for his willingness to join our team. 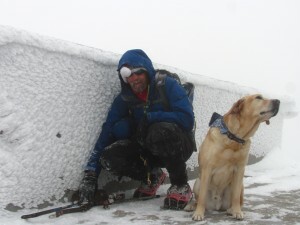 We had a considerable amount of experience already on the trip and we were generally well prepared so he joined to meet, learn a little about the guiding process we use for my total blindness, and to share the enjoyment of hiking. On the early ascent my Dog Guide Quinn did the work and those new to our team got to appreciate the subtle ways we worked the trails together. As we reached the general flats across the valley with the mud, water crossings and narrowed trails, I switched to a human guide for speed and efficiency under those situations. An experienced friend took that role (thanks, Sherpa John!) and Mike watched occasionally asking a few questions about the process. Mostly though, we were a comfortable group of friends sharing the wilderness. Mike’s excellent eye for photography proved to be an excellent eye for sharing some of the descriptions I might otherwise have missed. The easy-going comfort with which we all fell into conversations as well as times of quiet appreciation highlighted an awareness for allowing our group dynamics to develop naturally to allow us all to appreciate the hike in ways we wanted and needed. Guiding can be mentally taxing, and as John was a little tired Mike offered to give it a bit of work. He was a natural and showed quickly that he translates his personal comfort and grace on the trails to his ease in guiding my steps through it as well. By the time we rose out of the valley to the ridge line and up to the remote summit, we were all friends sharing the marvels of the wilderness and learning to understand each other and the treasures of experience and knowledge each had brought along with them. This is not a story about that hike. However, that journey can be found here. This is a story in which I want to talk about guiding. Mike guided me much of the way out of that trip, somehow amazingly taking me through the muddiest of trails while keeping his boots shiny and clean. Better still I was safe and smiling, albeit a little weary. Mike is in tremendous shape which is part of why he is able to be so effective in both guiding and his work with Search and Rescue. His mental toughness to keep high focus through a long day many find grueling was truly impressive, particularly for someone undertaking this for their first time. It was no fluke either as he would join me and guide more for our Carter Dome trek and once again highlight the knowledge, skills, fun, and friendliness with which he shares his passions for the trails and wilderness experiences. I’ve had many human guides on my mountain treks and a couple tremendous dog guides. 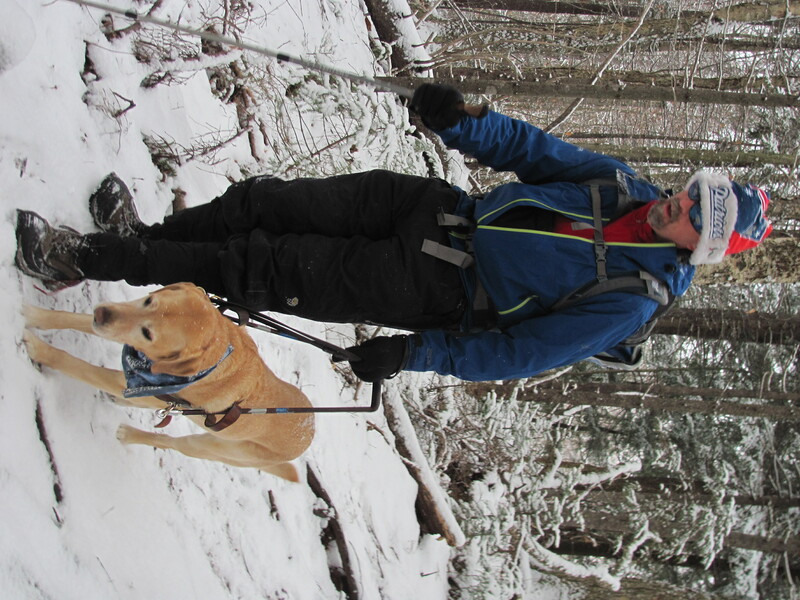 I make no secret that my life bond with my dogs has much to do with my preference for our work together even as I understand there are times when the right choice is to use a human guide for a stretch of trail or occasionally longer when speed or types of risk suggest it. The more time I spend with guides the better our effectiveness and rapport develop and the more effective a team we become. In two epic trips with Mike Cherim, it was clear to me how talented and capable we were as a team and he is as a guide in general for me as a totally blind hiker. 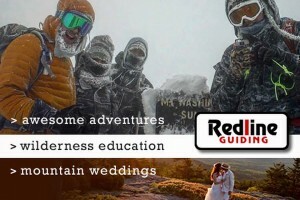 As such I am not surprised by and absolutely support his choice to make his passion a career choice with many options to enhance the experience of those who choose from the many fun packages–weddings anyone?! In fact, I applaud your choice if you decide to use his services with Redline Guiding but more importantly I suspect and the review agrees that you will applaud his services should you make such a choice. In this appreciative blog for his services and all my present and past guides, I have only one simple bias which is that I experienced and appreciated the time we shared on the path and so too, I suspect, will you. Tags: community, Inspiration, outdoors, Quinn, Support. 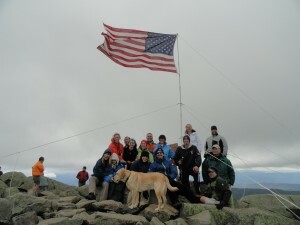 Randy and friends fly an American flag atop Mt. Moosilauke in honor of those who died in service, both civil and military. In honor of Memorial Day, our thoughts appropriately turn to the many men and women who have given their lives in service to our country. This week, in respectful appreciation, I will simply thank them for the service they gave and the freedom I experience. My only aside from this is to appreciate particularly a trio who are no longer with us and have served so very well. My father, Theodore “Bud” Pierce, served in Korea and has been gone from me nearly four years. My two prior dog guides, the Mighty Quinn and Ostend, each spent their lives in loving service to me directly and I’ll choose to reflect on them this memorial Day as well. Thank you to all who have served and no longer share the living world with us. 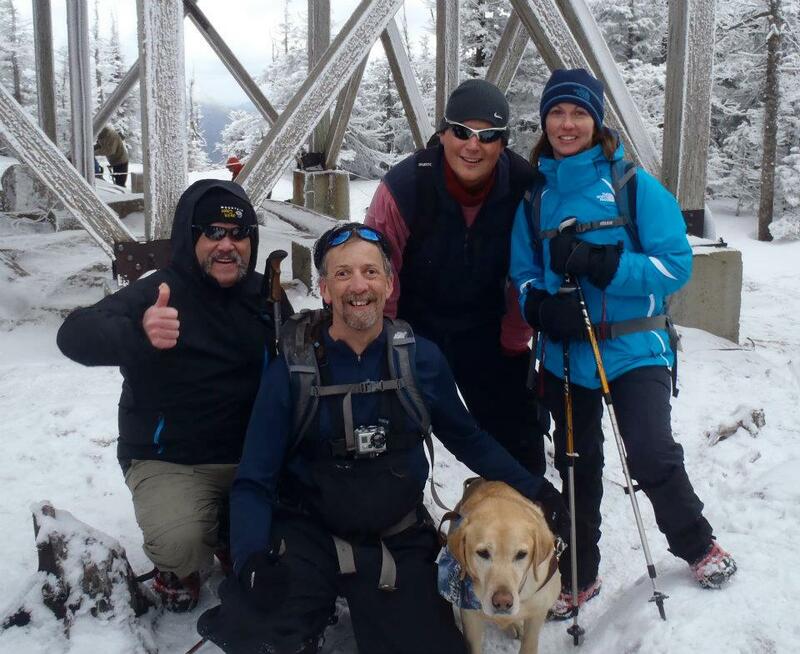 Tags: blind hiker, challenges, community, Hiking, Inspiration, outdoors, Quinn, success, winter. I am missing the mountains. My health has inhibited hiking opportunities recently and with a significant anniversary arriving, I took the opportunity to take a hike a little differently. 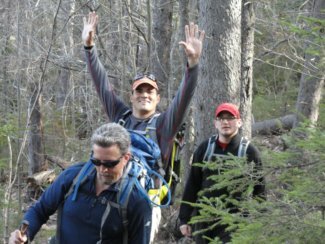 I listened to the video of NHPTV’s Emmy Award-winning show “Hiking in the Dark.” Willem Lange, Quinn, and I took this hike in July of 2013 although the show was first broadcast in February of 2014 and received the New England Emmy Award just one year ago. 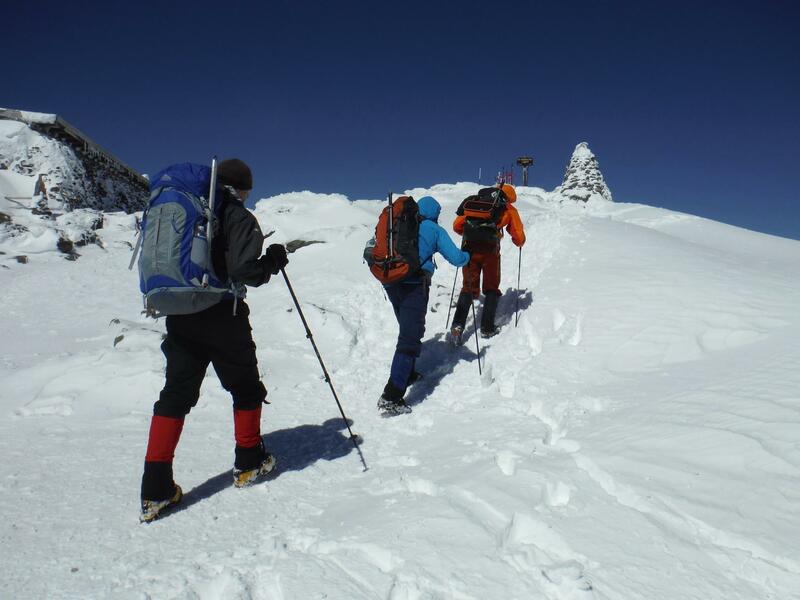 It was a 1.6-mile journey to the summit of Mt. Willard and for me it was the reminder of many of the wonders which are my reward for choosing to be on the path. Watch the episode above and savor the journey with us. Meanwhile I’ll share a few of my reflections from the day. Willem’s introduction takes a playful jab which set the tone for our relaxed blend of playful banter and in-depth philosophy. The trailhead at old Crawford Station begins with a short water crossing. It’s shallow enough I probably could have walked carefully through without concern but I chose to work it as if that wasn’t the case. Without my normal guides along to help support the process with information or even a human guide, we took it extra cautiously. The sticks were arrayed such that I could have trapped Quinn’s paws and thus it was the two trekking pole tactic for that short stretch. As we continued, Willem underwent the transformation many hikers experience when joining me. Initially he wanted to warn me about every possible obstacle and watched with concern as Quinn and I used our teamwork to traverse the trail successfully. In no time at all, Willem was sharing his insightful perspective with the many other hikers sharing the trail at various times along the way. I remember feeling my own pride as Willem seemed both appreciative and proud of Quinn’s incredible guide work. The interlude which included Tedy Bruschi taking on the Mighty Quinn in a mountaintop tug of war was an excellent diversion. Hearing Kyle’s laughter as he filmed Tedy doing a Quinn voice over is infectious. It was during this time Willem recommended I read the book The Art of Racing in the Rain which is written from a dog’s perspective. Having spent years writing Quinn’s dog blog often from Quinn’s perspective, it likely inspired my first published short story which appeared in Pet Tales in July 2014 and details the Mighty Quinn’s life. Another surprising revelation for me on my recent virtual hike came about as I heard myself reference my favorite mental picture. While I describe it in detail and it remains an incredibly potent image for me, I have often in my presentations discussed my two favorite photos, which are both Quinn images. I hadn’t realized my own transformative journey, for I have mental images of those two photos. The image I speak about is the last thing I ever saw with my eyes in this world–my first Guide Dog, Ostend–and remains a gift I’ll treasure all of my days. As the show closes out, Willem shares the success of our climbing Quest and the sorrow of his passing. As that sadness began to take a little hold on my heart, one last treasure snuck out for me. At the end of the hike I’d brought out Quinn’s tug ring for a little reward. That ring was originally Ostend’s, though he never much cared for tug. Quinn, however, was the master and delighted in every opportunity to match strength and wit. The toy which had traversed so many mountains on our journeys fell to his might that day in Crawford Notch. The end of the toy was a tribute to his might and the many many battles of Tug of War. It came at the end of the hike and far too close to the end, albeit unknown to us, of his life. I do not love endings. I do love the notion of the present both in immediacy and generalities. It’s what makes the whole hike what I celebrate and not just the summit. It is why we call this blog “On the Path.” As I wrap up this week’s entry, I’m also reminded that our best journeys can be taken again with some different results even as was necessary for me this time, virtually. Thank you, Willem Lange, New Hampshire Public Television and the crew of “Windows to the Wild” for giving me the gift of a journey I can retake time and time again. Overwhelmed? Feeling on the edge? School is back in session and we could use your help! Bad Behavior has blocked 154 access attempts in the last 7 days.